You want to take a long hike to see some nice views, beautiful trails, a gorgeous lake and some funky rock formations. If I was walking 2,200 miles, I’d probably agree with that sentiment. But since I was only walking 7.4 miles that day, and the Lemon Squeezer was one of the main reasons I’d come to this spot, I had the luxury of appreciating this little slice of more-difficult-than-it-needed-to-be trail. Plus, there was a well-marked “Easy Way” around the top of the Lemon Squeezer, for those looking to avoid that particular little adventure. If you’re comparing the Lemon Squeezer at Harriman State Park to the Lemon Squeeze at Mohonk Mountain House, you’ll probably be a little disappointed. The Lemon Squeezer is a great spot and absolutely worth a visit, but it’s not the one-of-a-kind adventure you’ll find at Mohonk, and not really a destination in and of itself. Good thing there’s so much other awesome stuff to see! The Lemon Squeezer had been the landmark that initially drew me to this hike, but I found it to be a sideshow compared to several other main events offered here. This 7.4-mile loop is beautiful for pretty much the entire journey, with different sights to see all the way around. It also features some open stretches of rocky trail that make it feel as if you’re WAY further from the nearest J. Crew outlet than you actually are. Whatever you like about hiking – climbs, views, lakes, ponds, solitude, ferns, big funky rocks – you’ll find it on this hike. And maybe on the way home, you’ll find some nice no-pleat, wrinkle-free chinos, too. **CAUTION** Harriman State Park features about a zillion different trails heading in a hundred different directions, some of them going to very remote locations. If you do not pay special attention during your entire visit here, your chances of getting lost are bordering on excellent. If you haven’t already invested in the New York – New Jersey Trail Conference maps for this area, I’d strongly recommend it. I’ll do my best to give you everything you need to complete this circuit successfully, but if you’re going to take navigation in this park lightly, you should really just pick a different hike, or pack an extra granola bar for the ranger who’s going to have to come rescue you. Maybe something with chocolate chips? (Read the Amazon user reviews on this trail book to see a real-life story where this exact situation happened in Harriman, minus the granola bar part.) Oh, you’re going to pay super-close, extra-special attention to the trail markings? Sweet! On with the hike! 1. From the parking area (See “Directions to the trailhead” below), locate the white-blazed Appalachian Trail marker on the signpost heading into the meadow (it’s on your left, assuming you are walking along the driveway into the parking area, away from the road). Hop on that trail! Time for an adventure. 2. Keep following the White Trail across the meadow, into the trees on the far side. You’ll almost immediately come to a well-marked junction, which is the start of your loop for the day. The next time you see this spot, you’ll hopefully have one awesome 7.4-mile hike just about conquered. And most likely some tired doggies (and by that I mean feet, but if you have actual doggies with you, then I mean doggies, too). 3. Ascend! Carefully follow the White Trail onward and upward, being careful not to get bucked off when an unmarked trail ventures off toward the paved road to your left. No worries – we’ll be ditching that road (and the road noise from I-87) soon enough. Over the next .8 miles, you’ll climb 589 feet. Enjoy! 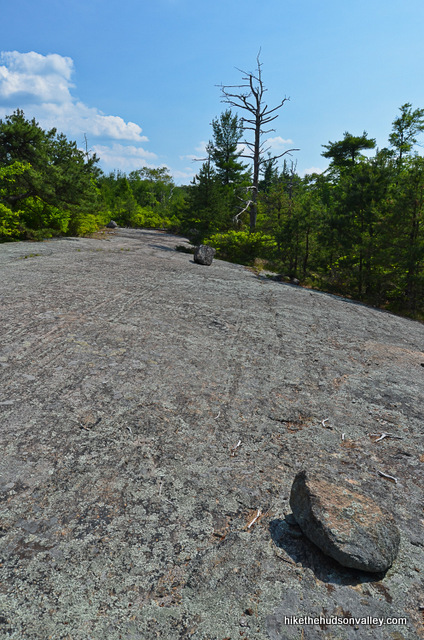 As you get to the top of this first hill, you’ll see some rocks just off the trail on your left that look like they might have some views on top (this spot is marked as a viewpoint on the New York – New Jersey Trail Conference map). My advice: Meh. Save your calories to spend elsewhere. You’re gonna need ‘em. 4. Continue following the White Trail as it crests that first hill and begins descending toward Island Pond. You might be able to catch a glimpse of some shimmering water through the trees. Careful not to get bucked off the White Trail by the numerous unmarked trails that wander around the pond. From the top of the hill, you’ll descend 200 feet over .4 miles until you emerge onto a wide-open gravel road that goes to Island Pond. Most trail guides list a visit to Island Pond as optional. It is NOT optional. Island Pond is gorgeous, and it will be a travesty if you come this close and miss it. Turn right to visit the pond, which is a flat 500 feet down that road. 5. If you ask me, Island Pond needs a better marketing department. The word “pond” conjures boggy images of algae, snapping turtles and bull rushes. This sure looks like a beautiful lake to me. What an awesome spot. This was a worthwhile side trip, no? When you’re done hanging out by the shore or lounging on the rocks, retrace your steps back up the gravel road to the intersection with the White Trail, and turn right to continue on your way. 6. From the gravel road, it’s another .55 miles (it took me 15 minutes) to the Lemon Squeezer. A couple of minutes into this stretch, you’ll pass over a wooden footbridge that spans a stone, uh, structure of some sort. I don’t really know what a sluiceway is, but I think this might be one. In any event, keep following this very nice rolling section of trail that parallels Island Pond (LAKE! ), visible through the trees on your right. And then – dun dun dunnnn! – the trail descends into the mouth of the Lemon Squeezer. If your loins are not sufficiently girded, you may want to consider girding them now. Just kidding. What you do with your loins is entirely up to you. 7. Before you enter the Lemon Squeezer, take note of the Arden-Surebridge Trail departing to your right, marked with the funktastic red triangle on a white background (henceforth referred to as the Red Triangle Trail). After you finish exploring the Lemon Squeezer, we’ll come back to this spot and hop on the Red Triangle Trail. For now, though, time to get squeezed! Duck in there and go as far as you like. You can pretty much exit the Lemon Squeezer at any time and come back down to the left of it on the unmarked trail that exists from people ducking out, but why do that? What a cool place. After the initial crevice, you’ll find a short rock scramble with a well-marked, blue-blazed Easy Way around. I recommend going up the scramble and down the Easy Way, but, you know, whatever works for you. Beyond that little scramble, it’s just plain old trail heading into the woods, going toward a place called Dismal Swamp (which sounds like a fabulous destination, but I hope you won’t get too upset if we don’t go there). NOTE: Depending on how you count ‘em, we’re going to visit approximately 10 more trails to complete the remaining 5.1 miles of this loop. If you aren’t going to pay attention closely to the directions from here on out, maybe you should head back to your car from here, or get that granola bar ready for the ranger who is going to have to come rescue you. The trails are all well-marked, but if you’re not playing a game of “locate the next trail marker and verify that it’s correct, and also keep an eye out for the next trail junction” things will probably go badly. Shall we stop belaboring this point now? Yes, let’s. On with the hike! 8. We’ll be on the Red Triangle Trail for about a half-mile. You like ferns? If so, you came to the right place. In less than ten minutes, you’ll cross over a small stream. 9. From the White Bar Trail intersection, it took me less than ten (somewhat swampy) minutes to reach our next junction, a right turn onto the Lichen Trail, blazed with a blue letter L on a white background. This fork is marked with a small cairn (fancy talk for pile of rocks) and those L blazes, but would otherwise be fairly easy to stroll right past. Please try very hard not to do that. 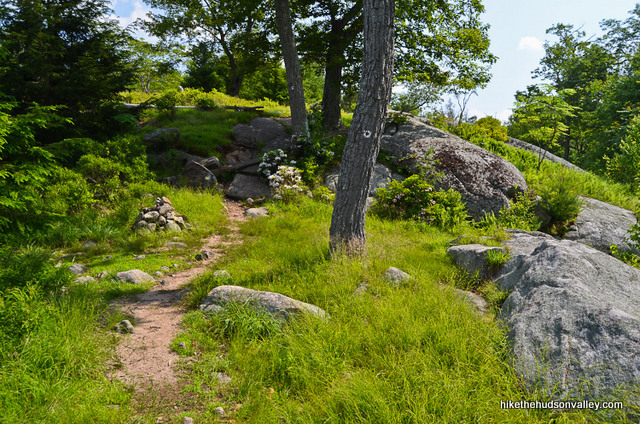 When you get there, turn right onto the Lichen Trail, my favorite trail in Harriman. I’m kind of jealous that you’re standing there right now, and I’m at my computer. 10. The Lichen Trail ascends through some underbrush until the trail becomes one big sheet of rock under your feet. Is it awesome up here or what? Feels like you just stumbled into the Maine backwoods. Carefully follow the painted blazes and cairns across the rock face, eventually ascending to your best view of the day. Boom. Grab a seat and enjoy it – this is the money spot. 11. When you’re done checking out the view, continue along the Lichen Trail as it plunges through some dense underbrush. This is the trail? Seriously? Seriously. Don’t worry, this part doesn’t last long. You’ll continue over more rocky, beautiful awesomeness for about five minutes as you scan for the next trail junction. You’re looking for a right turn onto the Ramapo-Dunderberg Trail, blazed with a red dot in the center of a white circle, heretofore referred to as the Red Dot Trail. You’ll see an RD (for Ramapo-Dunderberg, but really for Red Dot) painted on the rock at your feet, and some blazes on a boulder to your right. Follow that arrow to your right to hop on the Red Dot Trail, which you’ll be on for about 10-15 minutes. 12. Carefully hunt for those Red Dot blazes as you make your way across more wide-open rock faces. You’ll also venture through some less wide-open spots. Keep an eye out for the yellow-blazed Dunning Trail on your right – it took me twelve minutes to reach that junction from the start of the Red Dot Trail. I almost walked right past the Yellow Trail – it is NOT obvious. You’re looking for a cairn just to the left of the trail, right across from a large tree with a Red Dot blaze on it. To the right of that cairn, you’ll see a tree with a faint (faint as of June 2013) yellow blaze, and then a rock with a much brighter yellow blaze, just beside a trail that heads into the woods. Turn right here to hop on the Yellow Trail. **UPDATE June 2017** Per FL’s comment below, if you come across the Bald Rocks trail shelter on your left along the Red Dot Trail, that means you missed the turn onto the Yellow Trail and need to backtrack for several minutes. Be sure to keep a keen eye out for that little cairn and those yellow blazes — they’re very easy to miss! 13. From here, it took me ten minutes to reach the next (moderately confusing) junction, where you’re looking to merge to your left when the Yellow Trail joins forces with the White Bar Trail (which is blazed with a horizontal White Bar, and heretofore referred to as the White Bar Trail, since, you know, that makes sense). When you see the tree with crazy yellow and white blazes all over it, turn left (the White Bar Trail heads off straight ahead – I almost went that way, which would have returned me to the Lemon Squeezer, not the desired result). You should now be following the Yellow-and-White-Bar blazes of this hybrid Dunning(Yellow)-Trail/White-Bar-Trail monster. 14. From the crazy white/yellow tree, it took me 8 minutes to reach the next junction, where you want to follow the Yellow Trail to your right when it splits from the White Bar Trail. Keep your eyes peeled for the tree with two yellow blazes and one white blaze. Those yellow blazes are saying, “Turn right, Holmes!” Bid adieu to the White Bar Trail as it departs to your left, and turn right onto the Yellow Trail. 15. Carefully follow those yellow blazes through the woods. You’ll stroll past a very cool rock formation that surely at one time served as an ogre’s house. Immediately past the mine, the Yellow Trail joins an old woods road, on which you’ll turn left to continue following the yellow blazes. 16. Follow the old woods road for about one minute, then look for the Yellow Trail to split off to the right. The tree marking the fork has two yellow blazes on it. Turn right here to keep following the Yellow Trail. 17. Immediately after leaving the woods road, you’ll see the white-blazed Nurian Trail intersecting the Yellow Trail. Pay it no mind (though we will pay it some mind later today, at a different junction). Keep following the Yellow Trail. 18. If you’re from Troop 17 and you’re wondering what happened to your hat, this is where you lost it. Bummer! I thought you might want some closure. Everyone else, you know, you can skip this step. 19. In just a few minutes, the Yellow Trail approaches and skirts Green Pond. Now THIS is a pond. When I approached the edge of the pond on June 21, 2013, some crazy tadpole graduation ceremony must have just taken place. At first glance, I thought the ground was infested with termites or ants. Turns out, it was hopping with these cute little guys. There seemed to be thousands of them. Anyway, this is a very nice section of trail – enjoy the sights and sounds of Green Pond as you make your way around it. And try not to stomp on any cute little critters. 20. Just beyond the pond, you’ll climb a hill and, shortly thereafter, say goodbye to the Dunning Trail, when it ends with a three-yellow-blaze of glory (**UPDATE August 2016**: According to Chelsea’s comment below, there are now only two blazes here. Thank you, Chelsea!). Thanks for the good times, Dunning Trail! And hello again, Nurian Trail! Look at you, sporting your N on a white background! (Most of the blazes for the Nurian Trail are simply white, so we’ll refer to this as the White Trail after this step.) Turn left onto the white-blazed Nurian Trail to continue your adventure. 21. Follow the White Trail downhill as you enter the Valley of Boulders. With a name like Valley of Boulders, I was kind of expecting to see Rock Biter from Never Ending Story here. No Rock Biter, but if he ever shows up, he won’t go hungry. At the bottom of the hill, you’ll see a stream, which you do NOT cross (yet). Just follow the White Trail as it bends to the left, slightly uphill from the stream. No, I didn’t cross the stream and get (briefly) lost here. Why do you ask? 22. It took me about ten minutes to get to the actual stream crossing, just below a nice little cascade. Hop across the stream and head uphill to continue along the White Trail, ignoring the unmarked trail on your left that tries to trick you into going back downhill. Turn right on the Red Stripe Trail to start heading back towards your car. Note: My copy of the NY-NJTC Harriman map (remember, that map I strongly recommended that you purchase, and which also shows many other awesome Harriman hikes on it – the one that is in your hands right now?) is a couple years old, and it shows the turn onto the Stahahe Brook Trail happening AFTER you cross the Stahahe Brook, but this is no longer the case. The bridge that allowed that route looks like it got destroyed during a flood, and the trail has been rerouted on the near side of the brook. The Harriman maps have since been updated, and I would guess that the new version reflects this change. 24. Follow the Red Stripe trail as it meanders along just within sight of the beautiful Stahahe Brook. If you happen to notice a hornet’s nest just off the trail, do NOT stop to see if there’s any honey in it. I already checked – there’s not. You’ll travel along the Red Stripe Trail for about .55 miles (it took me 17 minutes, with an extended stop for hornet pictures) until you come to a very nice cascade at the site of the washed-out bridge. It’s a shame that bridge isn’t there anymore – what a nice spot for it. 25. From the washed-out bridge site, the Red Stripe Trail becomes an old woods road. Follow the Red Stripe blazes for another .3 miles, and the trail emerges beside a field on your left. Hello again, really loud road noise from I-87! We didn’t miss you today. You might not even notice when the Red Stripe Trail ends and you rejoin the Red Triangle Trail (also known as the Arden-Surebridge Trail) to continue strolling beside the meadow. The final three Red Stripe blazes are kind of hidden off to your right. In any event, whether you notice this junction or not, just keep heading straight/left when the Red Triangle Trail emerges from the woods to join us from the right. 26. The Red Triangle Trail takes us .36 miles back to the junction where our loop began today, so many hours and miles ago. Remember how young you were back then? It’s amazing you’re still so good-looking now, after all this time. 27. You’ve probably already stopped reading, since you can pretty much see your car from here, but just follow those white blazes through the field, back to the Elk Pen parking lot. Whooooo-weeee! That was an awesome day, wasn’t it? Bonus – if you’re still reading this, that means you can eat the extra granola bar you brought for the ranger who doesn’t need to rescue you now! Nicely done. Now who’s up for some shopping? Directions to the trailhead: From I-87 headed south from Newburgh, take exit 16 for NY 17 toward US 6/Harriman (your goal is to get on NY 17 South – the roads immediately off the exit are slightly tangled and confusing). Merge onto 17 West, then take the exit toward Central Valley. Keep left at the fork and follow signs toward 17 South & Harriman. Turn left onto Route 32 South, then stay straight to continue on what is now 17 South. Whew. Say, “See ya, suckers!” to all the people who exited for Woodbury Commons, and keep heading straight on 17 South for about 4 miles, until you come to the big fat “WELCOME TO HARRIMAN STATE PARK” sign at Arden Valley Road. Turn left onto Arden Valley Road. Continue .4 miles on Arden Valley Road. Turn right into the large parking area known as the Elk Pen lot (don’t get your hopes up for seeing any elk). When I visited, Arden Valley Road was closed just beyond the Elk Pen turnoff, so there wasn’t much danger of accidentally driving past it. Find a spot, hop out and let the adventure begin! You can also get directions by checking out the Harriman State Park: Lemon Squeezer, Lichen Trail entry on the HiketheHudsonValley.com Google map. Just turn onto Arden Valley Road (it doesn’t cross over 17, so there’s only one way to turn onto it – a left turn if you’re heading south on 17), and continue .4 miles to the Elk Pen parking area on your right. A cool Youtube video of the njhiking.com version of this hike – you’ll see everything in this video if you follow my trail guide above, with the exception of the section from 1:03 – 1:23, since I was trying to knock the distance down a bit. And at 2:08, it looks like they got a better look at the Boston Mine than I did. Oh, man, and that bridge at 2:27 has since been destroyed (mentioned in Step 24 above). Sad. Cool video, though! Another succinct trail guide from nycdayhiking.com, identical to the longer route chosen by njhiking.com above, and complete with some gorgeous fall photos. Also, there’s an explanation of why I didn’t get a better look at the Boston Mine – apparently, you have to trudge through the sludge to see the inner entrance. I feel like I made the right call on that one. I am not a hiker, I’ve hiked ONCE in my life, I think it was to Terrace Pond somewhere Milford-y NJ… I live in NJ and googled Lichen Trail and this site came up. So well written!!! I thought I was going to scroll passed some pictures and be done, but I got sucked in. You keep the perfect amount of details, brevity and wit to your writing. Plus, I’m a water girl, I would love to see that lake sometime. Made this read all the more worthwhile for me. Completed this hike this morning. First time in Harriaman away from the Bear Mtn area. I was all alone on the trail. Took less than 3hrs for me. Im glad i did it. Nice to hit a few of the major trails AT, LP, R&D. I used the Avenza map for Harrimam SP so there was no getting lost. Lots of nice colors, the Lichen Trail did make it worth the journey. Theres alot more of Harriman i want to check out not. Did this trail today with the pupper. Some great views along the way but didn’t make it past the end of the Lichen trail because a downed tree made it really difficult to decide where to go from that spot. I came on the tree about 8 minutes into the Lichen trail, right after you do a quick decline, couldn’t find a marker so just made my way back up and left the way I came in! Your trail guide was spot on as always up to that point. Thank you so much for this wonderful guide, I took this hike on a rainy late August day and I seriously thought I was transported to Narnia. The first time I hiked Harriman, I spent 45 minutes just driving around trying to decide where to park, I found this blog post and parked but didn’t have the balls to attempt this trail on my first visit. When I went back a second time for this adventure with my 4 year old boxer, we accomplished it in about 4 hours (with some stops, that’s boxer speed for you). Your instructions were perfection and I was chuckling a bit along the way making sure to not go past any key junctions. The only time I was genuinely confused was around step 11…it was hard to see that you literally have to climb up the boulder face. The views and scenery on this route are truly incredible, breathtaking, and magical. I also loved this hike for my dog since there is so much running water and “ponds” for him to get water, I usually carry a gallon for him but I don’t think it’s even necessary on this route. Thank you for making this so attainable, while the trail can be challenging, the scariest part to me is the navigation and this write up made it a piece of cake. Hi — I used this guide today, late February 2018, with no problems (except muddy shoes, but that’s probably seasonal). One update on Step 20 — the end of the yellow trail is once again marked with three reflector blazes, not just two. Since there are many places along the yellow trail where it crosses or runs next to the white trail, hikers should keep following the yellow until the three-blaze ending. Also, where the yellow trail ends I did not see any N’s on a white background — just white blazes. Thanks for the super-helpful guide! I made the most of the unseasonably warm day. I did this I did this hike last week (9.27.17) and really I loved it. We went during the week and there was NO one all day. I am an experienced hiker but my friend is not and we had some moments of stress as his anxiety to not find back home increased, we got lost a few times. I was confident we would find back home (parking). I did not print out the itinerary (to safe threes), but luckily his phone was working (my battery died) so by following step by step of your description we found our way back to the parking. We did this hike last weekend and it was straightforward providing you follow the step-by-step instructions. I would highly recommend using google maps. The map kindly provided on this website can be added to your google maps app and shows the exact trail route. That way if you feel you may have gone of course then simply check on google maps where you are (the blue dot) versus the trail, it’s accurate to within a couple of meters! The only occasion on which we went astray was in missing the yellow trail junction but thanks to google maps we quickly realized that and retraced our steps. Also, this site has been invaluable in our first steps into hiking so thank you very much to the site author! Did this yesterday – awesome hike. Your guide was invaluable. Can also confirm about the state of the Yellow Trail. It’s quite messy around Green Pond. But not impassable and actually turned out to be one of my favorite spots along the route. The whole loop was gorgeous. Thank you for writing this up, don’t know if I could have gotten thru it without your guide! Just did the hike yesterday and the red dot trail to the yellow trail is incredibly easy to miss. I would also suggest that for anyone going on the red dot trail, if you see a shelter on the left, then you have already passed the marker to get on the yellow. We were incredibly lucky to have bumped into a volunteer who helped us get on track. Also, just a warning that the yellow trail is sort of messy as of April 2017, and the markers may not be too obvious – especially around the pond area. Now, here is the biggest problem we’ve had on the hike and this is likely due to the little note about the trail changing due to a recent flood (step 22). After you cross the cascade, and the white trail leads you uphill, it takes you to the left. This goes the opposite direction (not sure if its on purpose) from the parking lot. This might snake around at some point, but we didn’t have the luxury to test it. So in short, after you cross the cascade, and you climb up the hill, you’ll see a well-worn path that is perpendicular to you. The white markers will head left. We decided to go the opposite direction of the white trail markers on the worn path, and somehow landed at the broken bridge in 10 minutes, and then we started seeing those white blazes with red stripes. What an adventure! Thanks, FL! I just updated the trail guide at Step 12 with your warning about needing to backtrack if you arrive at the Bald Rocks shelter – very much appreciated. For the comment on Step 22, I’m very hesitant to recommend any course of action besides sticking to the White Trail, which will definitely take everyone where they need to go. The path you mention may be a handy shortcut, but I’m going to err on the side of caution and stick with the marked trails. Glad your adventure out there ended successfully! Any place to camp along this route? Taking Boy Scouts next weekend and would like to follow this path. If you check the Northern Harriman map from the New York-New Jersey Trail Conference, it looks like the Bald Rocks shelter is just a short side trip from this route (at Step 12, you’d turn left instead of right onto the Dunning Trail, then find the Bald Rocks shelter via a short trail almost immediately on your right). I’m not speaking from experience, but that looks like it’d be my Plan A if I was trying to plan a night along this route. Hope that helps! Have a great trip if you give it a go! Hello, I would just like to thank You for the great work You’d done with setting this site up. I am not from US and was looking for some hikes around NYC and after reading all generic websites with short description that looked as if the author did not even bother to hike the trail, I was very glad that I found Your website. Great descriptions, map of trails, lot of photos – fantastic work. I went to 7.7 loop on Mt Beacon on Saturday and this Harriman trail on Sunday. Both were very nice, I personally liked Harriman better, just because it was less crowded, and the view at the lake was gorgeous. With Your guide I had no problem to find the trails and track all the changes of paths, so once again great work. Following on Chelsea’s comment on step 20 – here is a picture of a 2 yellow blazes on the tree. Woweeee! You were not kidding about it being easy to get lost! Thank you so much for such a wonderfully detailed trail guide. I made sure to always have a trail marker either in front or behind me at all times. I was a little nervous about attempting this hike since I usually go solo, but your directions have never steered me wrong in the past. I am so glad I went today! This was my first time trekking through Harriman State Park and I definitely want to go back soon! I know my legs (and ankles after some of those ankle-breaking, stony trails) will be super sore tomorrow but it was all worth it! First I would like to say I love this site. I recently started hiking and this site has helped me immensely. I have done a couple of the hikes from this site, and the more I do, the more confident I become in my hiking skills. The directions are spot on and greatly detailed. I did this hike yesterday and the directions were accurate and the hike was beautiful. I just wanted to mention one thing. We came across many down trees during our hike. The park did a good job with making sure the walking paths were clear. For the most part the down trees were not an issue, but it did become sort of an issue at the tail end of the yellow trail going onto the white trail. Some of the down trees had markers on them. There was a point where we could not find any more yellow markers (I did notice a down tree with a yellow marker telling us to veer left) but found trees with white markers. With the help of the app version of the Harriman map and this guide we were able to get back on track following the white trail. While following the white trail, we did run into the markers signifying the end of the yellow trail, but we never found the white N markers. So the moral of the story is, be vigilant when arriving at the tail end of the yellow trail (after the pond area) going into the white trail. Also get the map. Step 20’s yellow markers have changed. It is now only one yellow marker instead of the 3 shown. Thank you, Mike! I just updated Step 20 accordingly. Much appreciated. Thanks so much, Shannon! I just updated the guide again, removing the note I’d added to Step 20. Appreciate your help to keep the guide current! Just completed the hike today and step 20 is down to 2 markers. Thanks also for such a well written and witty guide. Kept me company on a solo hike without a map today. You rock!!! Thank you for the update, Chelsea! I’ve updated Step 20 (again) — much appreciated! Went to do this hike yesterday 12/20 and upon reaching Arden Valley Road we found that the bridge over the Thruway was closed for repairs. See note posted in link below – wish we saw this before we left! Luckily Schunemunk Mountain is only 25 min away so we did that instead. Got back an hour ago from this hike. Took my thirteen year-old and she loved it. I loved it. Yes, this hike delivers. I live very close so I was able to be on the trail really early while still being able to take nice breaks here and there. FYI–we left the park at about 1:50 (Sunday) and the lot was full, with people still heading in–lots of people who looked seriously unprepared to hike. If you’re hiking this hike, start early and make sure you’re prepared. Even with temps ranging from the 50s to 60s, we still went through a lot of water. Also, I didn’t have the map you recommended but I was able to use the NY-NJ Appalachian Trail map 2 (Dennytown Road to NY 17A) since it covers this section. The Harriman maps are probably best, but you can feel relatively secure with it in your pack. Thanks again for writing up these hikes. This is my second hike from your blog and I can’t wait to do more. Happy hiking!!!! That link you posted to the EveryTrail marked map – i tried to download the app but it seems like it’s no longer available, at least in the iTunes store. I thought it would be a cool thing to have for the hike. Do you think I will be fine using just your guide and the most updated copy of the New York – New Jersey Trail Conference map for this trail? I’m a semi-novice hiker. Thanks!!! I think you’d be fine with the paper maps (woo-hoo!) and the guide above, but the app is supposedly very cool, and helps you track your progress in real time. Hope this helps – happy adventuring! Thanks for the excellent guide!!. I followed it closely and enjoyed the hike very much. It was very accurate and the commentary was entertaining. The intersection from the red dot to the yellow trail was as you described. Easy enough to find. Thank you so much, Keir! I just removed the update that questioned whether the instructions for that junction (in Step 12) were still okay – I really appreciate you taking the time to confirm all is well there. Thank you! Hey Chris! Loving the site! Wondering if you’ve ever considered putting GPS coordinates for the trail heads in the descriptions? I’m having trouble accessing the Google map you made on mobile but if the GPS coordinates were included in the directions, would make it super easy! 🙂 thanks for creating this amazing site and breakdown! Hi Jocelyn! Google Maps used to make it really easy to pull the coordinates right off the pins, so I never messed with adding them to the trail guide write-ups. With the most recent update of Google Maps, though, that functionality has either disappeared or has been moved somewhere very difficult to find. I’ll add it to my to-do list to add the coordinates to the write-ups, but it may be a while before I can get around to doing it for all of the hikes. Thanks for the suggestion! Hi! Thank you so much for this guide. The pictures in this step by step guide helped a lot in finding the markers especially when switching between trails. My wife and I are novice hikers so we did get lost a couple of times despite having the GPS and this guide. Most notably the part where we thought the red stripe trail crosses over the Stahahe Brook. This was because our map might not be the most updated one. I wish I read your instruction about it being re routed more clearly before we lost 30 min of our time (and we were short on daylight at that juncture!) Overall, great instructions that helped us tremendously in finding our way back to our car. I’m sure i’ll be reading more of your guides for hikes to come. Thanks again! First want to say that I’ve probably done 10 or so of your hikes to the tee over the last 3 years. On each hike I pull out my phone numerous times to check where “my friend” (that’s you!) says to go, each time earning a laugh from my wife. This past weekend we picked up some lost stragglers on the Popolopen Torne hike, and they too got in on the joke, asking which way my friend was telling us to go; I think you may have received a couple new fans/followers by day’s end. All that is to say this site has been an extraordinary resource for me and the many people (I’m counting 19) I’ve dragged along on one of these hikes over the years. Thanks so much! 1. I think it may be better to do it in reverse order. The best parts are the views and the lake, which are closer to what you have as the current start. We, of course, opted to eat lunch at the money spot, which lead to a bit more after-lunch hiking than I would have preferred. 2. We picked up the yellow trail from the red dot at a completely different spot – it was coming in from the bottom of an open slanted rock face (we happened to see the trail veering down off into the woods below). Not sure if this before your intersection or we missed the identifying cairn, but just something future hikers may want to be careful of: If you’re hiking along on RD and see yellow coming up from below, you’re able to take that, start descending and continue with these instructions. Keep up the GREAT work and thanks so much for making so many of my days so great! Noah, my friend, thanks so much for the awesome comment! Really fantastic to hear. When I first moved here, I had these local trail guides written by Peggy Turco (links to her guides are in the FAQ), and we always used to joke about how we’re going on a Peggy hike, or hanging out with Peggy for the day. I actually tried to call her once, to see if she’d join our hiking group for an outing, but I don’t think I had the right number. The lady I spoke to thought I was from Verizon, and I couldn’t convince her that I wanted to talk about hiking, not disconnecting her phone. I’m digressing a bit, but the point is that I’m honored to be somebody else’s Peggy. As for the hike, a counter-clockwise (hang on…okay, yeah, counter-clockwise) traverse would be a good way to go, too. It would take me a hundred years to reverse engineer this trail guide, so I’m going to leave it as-is, but I could certainly dig doing it the other way. For your second point, dude, I wonder what’s going there? Looking back at the map, there’s only one intersection of the Red Dot and Yellow trails. If that has changed since I wrote these instructions, I’d love to know that! If anyone else reading this can verify (a picture would be great!) if Step 12 above needs an update, that would be awesome. For now, Noah, I’ll link down to your comment from that spot – hopefully that will avoid other hikers getting tripped up there. Many thanks! Noah, based on Keir’s comment above, I removed the link down to this comment and the accompanying update. Looks like the instructions above for Step 12 are still A-OK. Thanks for helping to keep this guide as accurate as possible – much appreciated! Just finished this fantastic trail today leading a group of 20 adults and kids. Your detailed guide was a huge help! I couldn’t imagine how many times we would have missed marks and got lost without your precise direction. Everyone had great time and is looking forward to next adventure from your website! Thanks for the excellent work! This comment made my day! Thanks so much – glad your group had a great day out there. Sorry I missed this comment when you initially posted it, Sam! So glad to hear this trail guide was useful to you. As far as Storm King, I just have the one short hike (2.5 miles) documented now, but there are plenty more options that I’d love to get out and try myself. Let me know if you find any winners out there! I hike this area of Harriman often. You’ve done an excellent job describing the trails, markers and scenery.! Your attention to detail and warnings are spot on. The Lichen Trail, IMHO, is the most stunning area of Harriman, especially in the Fall. After reading your hike summary of an area I know well, I’m very confident to use your info on other hikes you’ve listed that I have yet to try. That’s awesome, Kim – glad to get that feedback, thank you! Hope you find the other guides here to be useful as well. Happy trails! Hiked this trail over the weekend and was one of the best days I’ve had in forever! This was a gorgeous hike, varied and full of surprises–we loved it. Trail guide was right on and so helpful–your commentary amusing at times too! Thank you for providing such excellent details. w00t! That’s awesome, Amye. Thanks for taking the time to leave this comment – made my day! I have hiked all over the world, and this was one of the most beautiful hikes I have ever been on, we loved the variety and surprise element. Only criticisms we could think of were that there were no glaciers, sulfur pools or volcanoes JK, the hike was wonderful, like a scavenger hunt. One minute you were in Maine, then in a hobbity like forest. bogs, ponds, lakes, pine forests, caves, waterfalls. So beautiful. Thank you so much for creating this hike. The directions were excellent, especially since we did the stupid approach and did not bring a map (buying one right now). I’ve lived in this area all my life, had no idea this beautiful park was so close. Just an FYI, my “fitbit” said the walk was about 9 miles, so we were good and tired by the end, but the good kind of tired. Fantastic! So glad to hear about your experiences out there, Curlygrrrl. This comment made my day. I wouldn’t be surprised if the hike is indeed a little longer than my GPS reported. The NJHiking.com write-up I linked above gave their mileage as 8.5 miles, and their version included an extra jog at the top of the Lemon Squeezer (perhaps a mile) that I cut out, so the 7.4-mile estimate feels pretty close, but different devices can give very different results. We should probably all eat an extra slice of pizza, just in case we actually hiked 9 miles. Thanks so much for taking the time to leave this awesome feedback! Did the hike today, fantastic trail guide. The visitor center was closed when I made it in from long island this morning, so I was forced to do it sans map, something I would not have attempted without such a specific trail guide. I kept my extra granola bar for myself, didn’t need any rescuing today! I just moved here from Oklahoma, and I will be returning to Harriman and the surrounding area in the future, and will use your trail guides. Thanks again for taking the time to put these up here, they saved my trip. That is really awesome to hear, Nick – thanks so much for taking the time to leave this comment! I posted this to the site’s Facebook page (https://www.facebook.com/HikeTheHudsonValley/posts/760929757274966?stream_ref=10) but just realized I never replied here to thank you. Thank you – and welcome to NY! I hope you have many more great hikes ahead of you here. Very beautiful fall hike, the forest changing colors looked really nice. I agree , Island pond view was amazing! That name does not do it justice! We accidentally took a wrong turn on the gravel road and instead of getting to the pond we got to some kind road, and we saw a family strolling the gravel road, i think they may have parked somewhere on arden valley road maybe. Shortened the hike a little, since we got to the money spot view and then took the blue, red and white trail back. Probably ended up being 4-5 miles. Thanks for the nice comment, Maggie! I’ve been curious to hear from someone who tried this trail guide, since there are so many trails and turns to keep track of. If you took that wrong turn because of something I wrote (or should have written), please let me know so that I can update the guide! Glad you had a good day out there.